All men face the possibility of having Prostate Cancer at some point in their lifetime. What should you know? What should you ask? Who should you ask? To Pee or Not to Pee gives you the basics. All men are faced with the possibility of having prostate cancer sometime in their lifetime. TV, newspapers and magazines present a sea of conflicting information and misinformation. 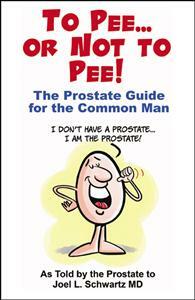 Who better to navigate you through this maze than the prostate itself? Normal development, the PSA controversy, risk factors, biopsy criteria, tumor classification, how to pick the right doctor, treatment options, support groups, benign prostatic hypertrophy and prostatitis are some of the subjects that are explored and illuminated. This book will provide you with information to help you intelligently participate in all aspects of your care.